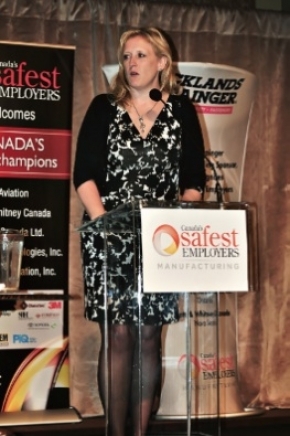 The Honourable Lisa Raitt, Canada’s Labour Minister, attended the gala dinner honouring the winners of the 2011 Canada’s Safest Employers Award. She underlined the importance of workplace safety and spoke about recent accomplishments in the field. The gala dinner was held on September 27th, at the Liberty Grand Entertainment Complex in Toronto. In speaking to attendees, Raitt shared her personal experience of a workplace-related death in her family. Her brother died of lung cancer when he was 36 years old. As a young man, he worked in the coke ovens in Sydney, N.S. Raitt talked about how the loss of her brother affected her family. "It is one of those moments in our lifetimes that changed the fabric of our family forever." "As labour minister, I have a very keen connection to what you all do in terms of keeping your employees safe," she told attendees at the awards dinner. Canada’s Safest Employers Award was launched in December 2010 by Canadian Occupational Safety magazine to recognize Canadian organizations for the work they do to keep their workers and workplaces safe. The Labour Program develops, administers and enforces workplace legislation and regulations, such as the Canada Labour Code, which covers industrial relations, health, safety and employment standards for federally regulated workers and employers. George McClean, vice-president of Acklands-Grainger, the award's national founding sponsor, echoed Raitt's commendation of the companies that are doing great things in creating safer and healthier workplaces. "The companies that are here today, and particularly the winners, know that luck is not a factor," McClean said. "It's about compliance programs, procedures, trainings, and most importantly, leadership and a safety culture." More than 150 guests attended the gala dinner to honour the inaugural winners of Canada's Safest Employers in Manufacturing Award. Event organizer, Canadian Occupational Safety, announced the award will be expanded in 2012 to include industries other than manufacturing. "Next year, the search for Canada's Safest Employers will extend to the construction, mining, oil and gas, natural resources and the service sector, making this prestigious award truly a national program recognizing outstanding companies for the outstanding work that they do in promoting the health and safety of their workers," COS said. The 2011 Canada's Safest Employers are: Atotech Canada Ltd. in Burlington, Ont. ; CCI Thermal Technologies in Orillia,, Ont. ; GE Aviation of Bromont, Que. ; Innovative Automation Inc. of Barrie, Ont. ; and Pratt & Whitney Canada — Halifax Operations in Enfield, N.S.